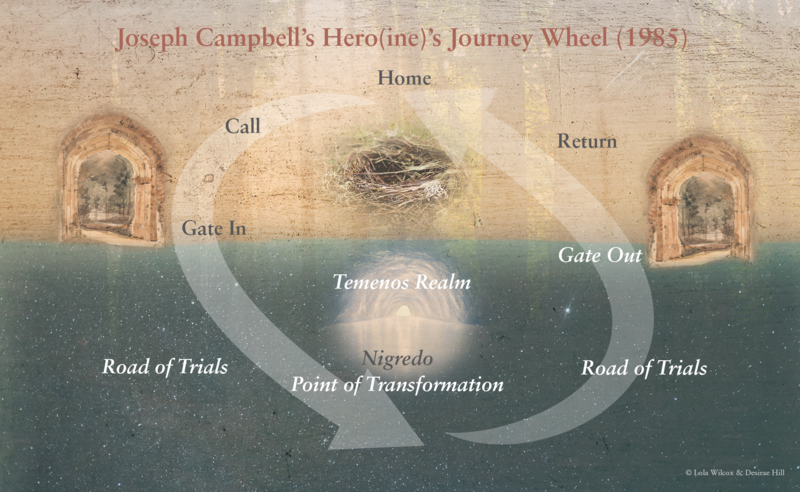 Joseph Campbell, a leading figure in comparative mythology and religion, gives us the journey every person takes as found in cultural mythologies worldwide. This drawing is from one he drew for us on a flipchart in a workshop at the Great Mother Conference in Mendocino, CA in 1985. He published The Hero with a Thousand Faces in 1949, so this lecture was around 35 years after that. The Journey begins at Home, where the hero or heroine receives a Call. The arrows are traveling counter-clockwise because, Campbell said, we are not moving in linear, clocked time. The journey might be over a day or a lifetime. But, although it is neither in time nor over a distance that we are traveling, we are moving through a series of events through a transformation. My play Gates In and Out follows the transformation journey of Every Soul, and I recommend reading it for a fuller discussion than I am sharing now. Basically, there are Three Landscapes and Five Steps. The journey begins in the exterior world where a person exists, for example Jane Goodall, world expert on chimpanzees, or you or me. I also believe places go through transformative journeys, for example the courtyard of my condominium or Goodall’s Gombe Stream National Park, Tanzania. Home is the Status Nascendi, the birthplace where the person or place is when the Call comes. It is the state of being that desires or needs transformation from its current to another form. Temenos is originally a Greek word for a holy place not for common use. Carl Jung uses the word to describe a magic squared circle or safe spot where therapeutic healing occurs, and where one meets archetypal energies. The tricky part is that one is living in the Home, the Outer World, while traversing the Temenos. The Nigredo is the place of alchemical transformation. It is the Cocoon, the place of immobility where the essential development from seed to plant, from caterpillar to butterfly occurs. It’s helpful if it can occur in a protected environment, but for modern souls and places that doesn’t happen very often. The resisters of transformation, from families, friends and co-workers to game poachers and marketeers, are many. For people the Call usually comes when we have reached a place of discontent, and may even be making comments like “I need a new job”, “I want to go the Jedi Flight School”, “I need to retire”: “I need a new life”. We know that if we don’t respond at first, the Call just gets louder. For an addict the process of the Call comes often during a descent of loss; for a corporate C.E.O. it finally may be noticed as a diagnosis of acute stress from an ascent of success. It seems the situation gets worse until the person responds to the Call. For a place the transformative Call may be destruction, as in Yellowstone fires in 1988. The park transformed from these fires, and we learned as a culture that our current understanding of forest fires was flawed. The introduction of wolves is another Yellowstone transformation story. When a person responds to the Call, they leave Home territory and enter the transformational Temenos world. There is an identifiable Gate In, which in many fairy stories is guarded by dogs or dragons who need to be distracted or paid off. The journey proceeds along the Road of Trials, which often is a sequence of tasks of increasing or different difficulty. Getting through a sequence of trials increases savvy and endurance, but on this side of the Nigredo it is all preparation. Just when things seem about to work out something happens, and movement is immobilized. Disintegration begins. The journey crosses into the Nigredo. If all goes well the person or place makes it through the transformation, and emerges. What mythology based in multiple cultural experiences tells us is that the transformed entity has to move through the second half of the Road of Trials and find the Gate Out. Now the new entity is integrating, and the trials help that process. A longing, a goal, a dream often give shape to the Gate Out. The final step is to Return, sometimes to the old Home or often to a new one. If this step is hurried, mistakes are made, and the fragility of the transformed entity is tested. This is a time for awareness of everything, for paying attention to each step or building block, to where Home will be. This blog outlines the Hero/ine’s Journey. Each story, play, book I write is an example of a journey that a person or a place is making or has completed. If you have questions or comments about any publication inside the website content, please contact me.